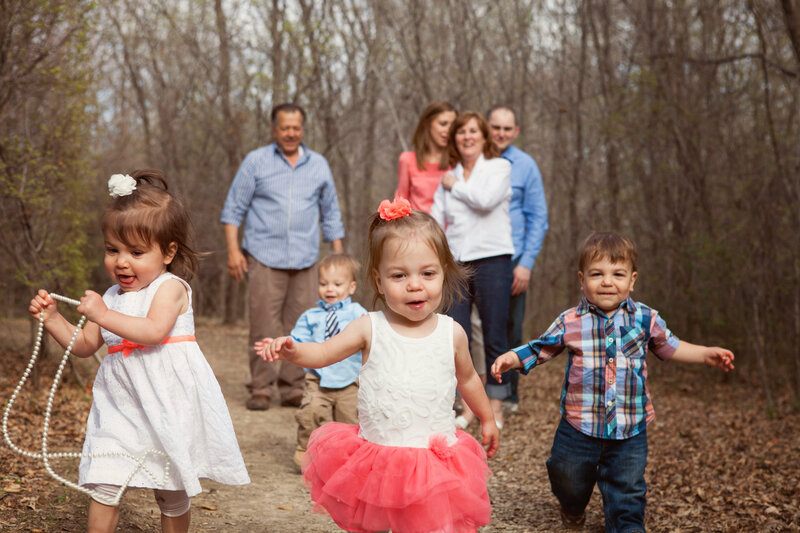 Toddlerhood (or quaddlerhood in our house) is a time of many transitions from being a baby to a big kid. This is especially apparent with feeding. The days of bottles and thin purees are a thing of the past. I knew spoon feeds were over when Harper started letting whatever was on his spoon drop from his mouth, filling his bib. He quickly asserted his independence and insisted upon self feeding. That doesn’t mean that feeding is necessarily more simple. The quads are limited in what they can self feed since they have approximately eight teeth a piece and have finicky toddler palates to boot. What the quads will eat varies from day-to-day. For example, steamed carrots are usually a fan favorite, but they’ve been refused with animosity as well. Plus, each of the quads has his or her own opinions about food. Mason would be content to survive on fruit and yogurt alone while Sydney prefers protein and carbohydrates. There is one thing they all consistently agree upon: cookies and crackers. All four know how to sign, “more”, (“please” is emerging also) but they only sign for desired items. When we were given an opportunity to sample a line of organic and natural snack items under the Suzie’s brand from Good Groceries, I jumped at the chance. When feeding the quads, I prefer to avoid additives and preservatives as much as possible, and Good Groceries has the same philosophy. I was puzzled when our UPS driver delivered a giant box to our doorstep a few weeks back. We order many things online, but I could not recall ordering anything of this size. I excitedly sliced the tape off the top and peeled back the box top to find our shipment of snacks from Good Groceries. They generously provided us with an assortment of their snack crackers and milk alternatives. I was expecting something, but did not anticipate getting to sample so many products from their Suzie’s brand. Our shipment included: cilantro/ garlic/ green chili naan crackers, plain unsweetened quinoa milk, vanilla sweetened quinoa milk, vanilla unsweetened quinoa milk, sesame kamut flatbread, ancient grain flatbread, breadsticks, olive oil crackers, rosemary sesame crackers, tomato oregano crackers, sourdough puffed rice crackers, ancient multigrain crackers, baby biscuits, thin cakes with sesame, and salted thin cakes. Shortly after our box arrived, it was coincidentally snack time. 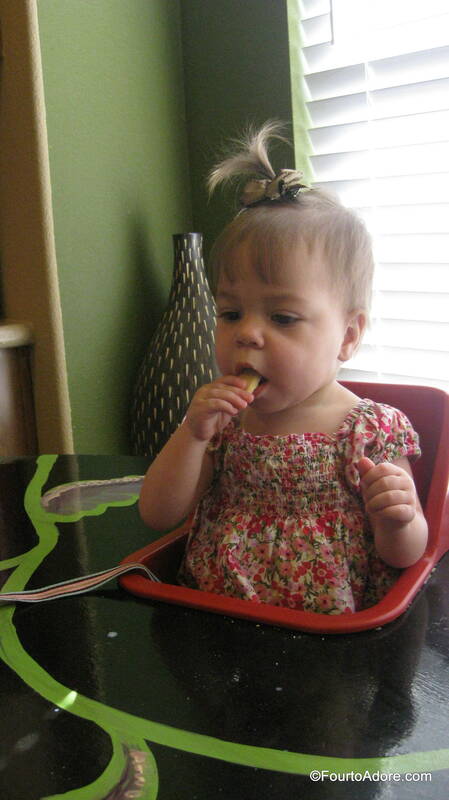 Thus, we began our taste test with the baby biscuits. Before giving the babies anything, I always sample first to make sure it’s okay. I was pleasantly surprised by the light shortbread flavor and soft texture of the baby biscuits. I hate to admit it, but I scarfed a few of these myself! They crumbled with ease so they would be safe for babies with few (or no) teeth. Apparently the babies agreed as they gobbled the biscuits up and eagerly signed “more, please” repeatedly. Needless to say, the baby biscuits did not last long in our house. As I snapped this picture, Rylin became impatient and attempted to grab the entire box for herself (she didn’t realize the contents were in the white bag centered on the table). Sydney tends to be the most challenging to please, but she signed “more” for these with gusto. In our house, we go through 3-4 gallons of cow’s milk per week. Since it takes up too much space in our refrigerator, we have to make multiple trips to the grocery store to keep the milk flowing. Sometimes, we run out of milk in the day so I keep a variety of milk alternatives that do not require refrigeration (until opened) on hand. 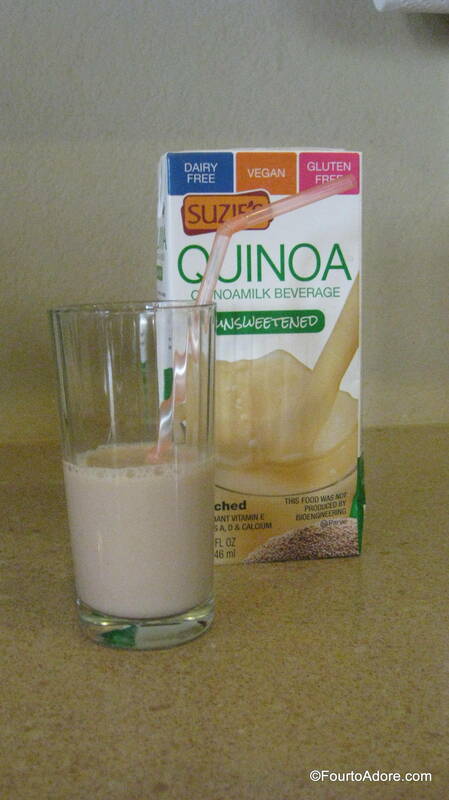 I had no idea quinoa milk existed prior to receiving some. It is definitely another option or us to keep on hand for the days when cow’s milk is gone. Thankfully, we don’t have any dietary restrictions, but for those who do, quinoa milk is dairy and gluten free, and is also vegan. 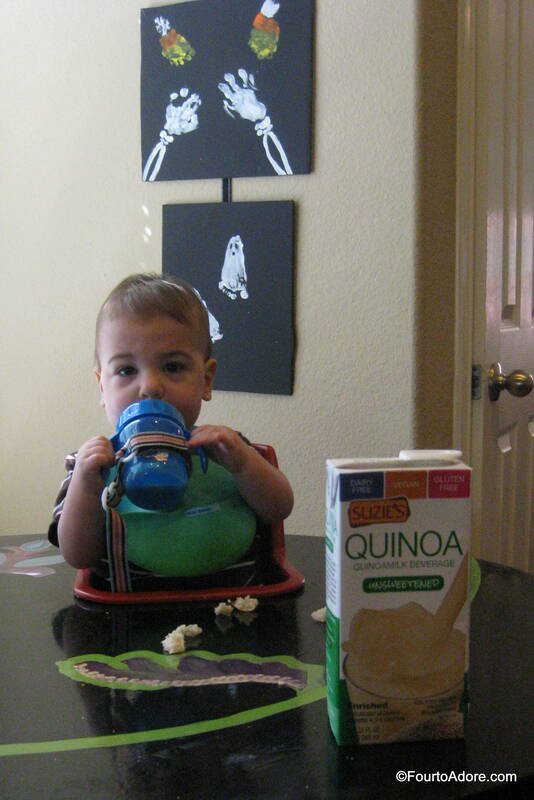 I found the quinoa milk to have a rich, nutty flavor and wasn’t sure the quads would approve. They did! The boys gulped it just like they do with cow’s milk! They even enjoyed the unsweetened version. I’m personally not a big milk drinker, but I enjoy the occasional bowl of cereal for breakfast. 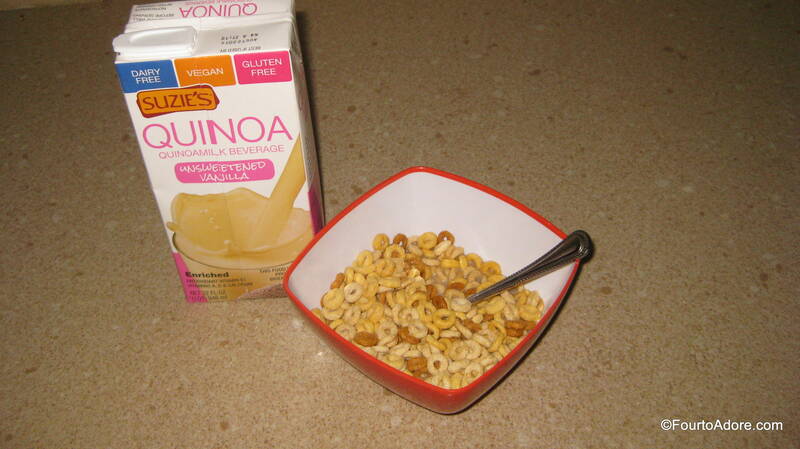 I thought the nutty flavor of quinoa milk was a nice balance for slightly sweet cereal. All of the saltine crackers are packaged into portion sized four packs, which is perfect for making quick lunches or tossing in the diaper bag. Four packs are always a winner with quads! Plus, portion sized packages keep crackers from going stale. 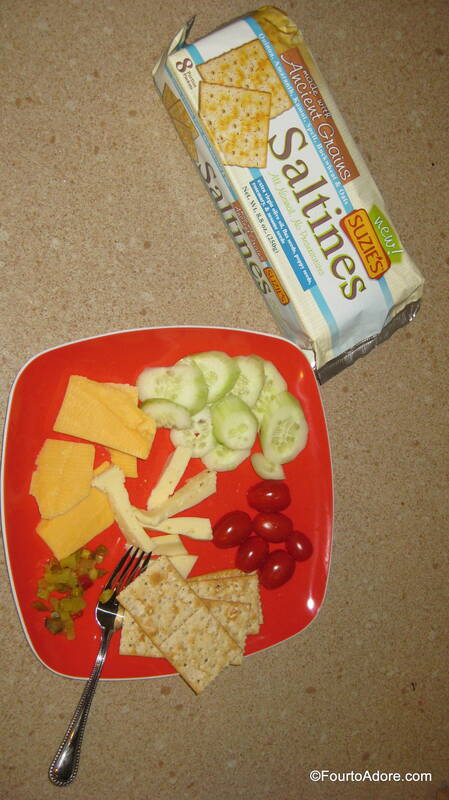 Each of the saltines paired well with crudites and cheese (any variety). I especially enjoyed the herb flavored crackers- tomato & oregano and rosemary & sesame. They were flavorful alone, but nice compliments to spreads. 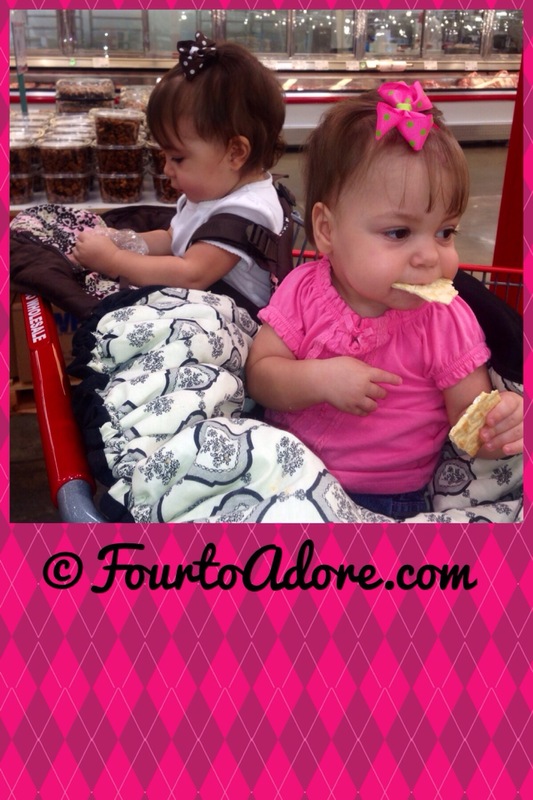 Sydney LOVED Suzie’s saltines and sourdough rice tops so much, she swiped one from Rylin. Notice, she has one in her fist and the other gripped between her teeth. The babies screeched and begged for more thin cakes at each snack time. 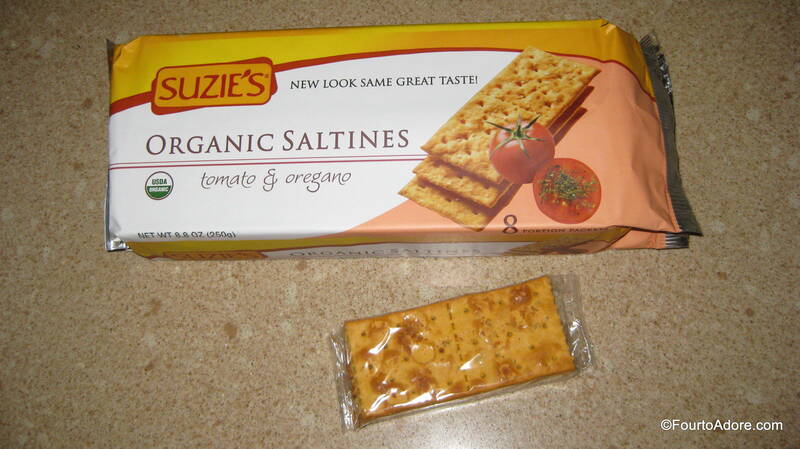 Unlike typical puffed crackers, Suzie’s are extremely thin and soft enough for babies to munch. As a decadent treat for myself, I spread chocolate hazelnut spread over them. They were also tasty with peanut butter, which is a protein source go-to for the quads. 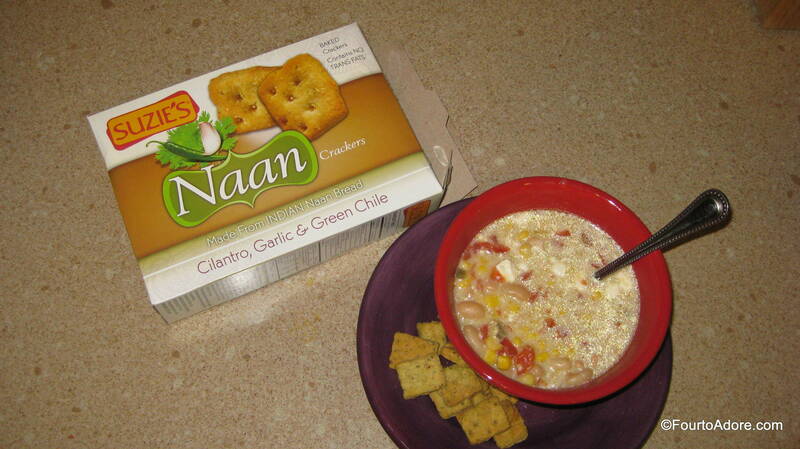 The naan crackers were the perfect companion for my crock pot green chicken chili on a cool fall night. Rylin caught me snacking on them one day and plead for a taste. I was a little hesitant due to the heat in them, but she said, “Mmmm!” and signed “more please”. I guess she is a true Texan with a pepper belly. George and I found the flatbread perfect with our Greek pasta salad and homemade hummus. 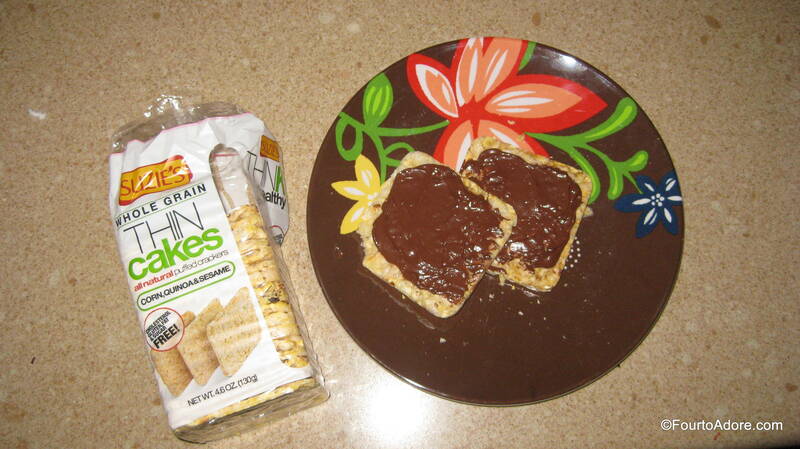 Just like with the crackers, they were flavorful enough alone, but paired well with spreads. So what about nutritional value? 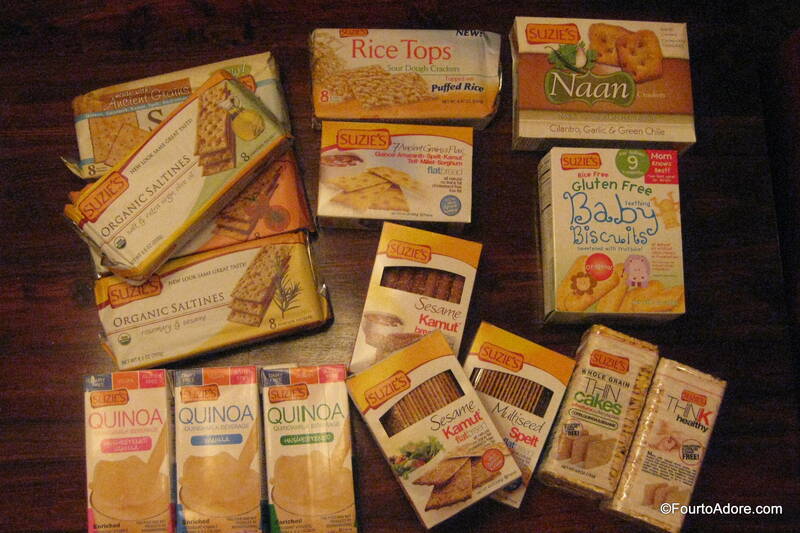 Suzie’s brand uses ancient grains: quinoa, kamut, spelt, buckwheat, and oats as well as flax, sesame, and poppy seeds. Therefore, I was pleased to find at least two to three grams of protein in each serving. Because these are snacks, they aren’t totally void of sodium, sugar, and carbohydrates, but these less desirable ingredients are minimal. Therefore, I felt confident feeding them to the quads. Best of all, our entire family enjoyed the products we sampled. 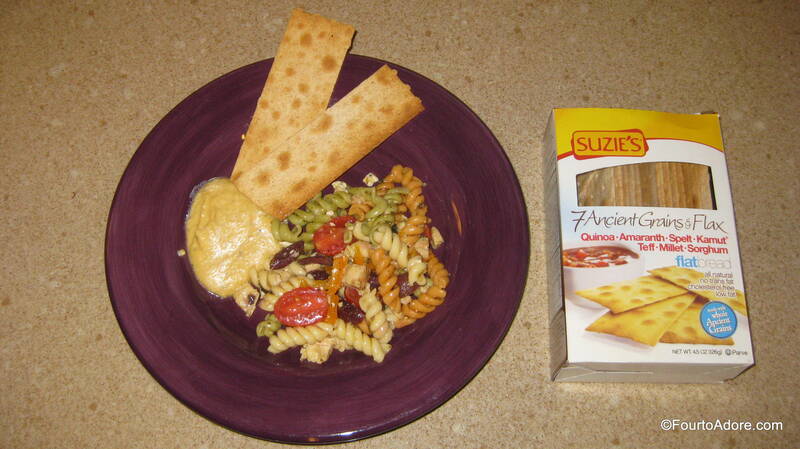 Suzie’s brand products can be found nationwide at supermarket, natural, specialty, and club stores, in addition to online at amazon.com and goodgroceries.com. Because many of our household items are purchased via Amazon, I was very happy to know we could buy refills of our favorite Suzie’s items there. P. S. I would like to thank Good Groceries for kindly providing the array of snacks for us to sample and review. No other compensation was provided. All thoughts and opinions are 100% my own.